You know you're getting old when the thought of a new washing machine excites you. When Beko got in touch and asked if I'd like to review one of their new washing machines with a 28-minute cycle it was as if all of my Christmases had come at once AND they are giving one away to one lucky reader too (just scroll to the bottom of the post to enter). You can check out the full range of new Beko Washing Machines here, I opted for model WY 124854MW. I was drawn to the fact that it can hold a 12kg load which can be washed in just 28 minutes. There are also a few features such as SteamTherapy which reduces the need for ironing (handy for me as I am not known for my love of ironing). Delivery was arranged through KnowHow who I have to say weren't the best and there were a few issues that had I have been a paying customer I wouldn't have been happy about (eg messing up delivery dates and then having the wrong info on the delivery sheet which took around 30 minutes to sort out). We got there in the end though and now my machine is installed, I honestly could not be happier. My new Beko Washing Machine replaces my Whirlpool washing machine which was around 2 years old, cost around £300 new and didn't have any fancy features. It was also only 7kg in capacity which in my opinion was far too small for a busy family of 5. I've owned washing machines with shorter wash times before but they've always been for smaller loads. The Beko WY 124854MW Washing Machine states it can wash a full 12kg load in just 28 minutes. It's worth pointing out that this wash will only be at 30 degrees and times may differ ever so slightly due to things like water pressure. First of all, I wanted to wash my chair cushions but didn't really want to go a full day without them - the 28-minute cycle worked perfectly. There is a clock on the front of the washing machine that counts down how long is left and I trusted it. But then after I'd used the 28-minute cycle a few times, I realised that it seemed to take longer than 28 minutes so I decided to time it using my phone stopwatch too. Then I timed it again to be sure. I discovered that a 28-minute cycle actually takes closer to one hour for me and the clock on the washing machine self-adjusts so isn't a true representation from the start. I use the 28-minute cycle with around half a load of washing (school uniforms mostly) and using a washing capsule in the drum rather than washing detergent. Beko say water pressure, temperature, the detergent used and unbalanced loads can all cause the length of this cycle to be increased which is clearly the case in our house. Although the fact that our quick daily wash cycle takes longer than the promised 28 minutes, a one hour cycle is still shorter than my older machine and I'm happy to take it. I can now wash the kids' school uniform when they're in the bath and have it washed, dried and put away before they go to sleep which is unheard of in the past. There is an even quicker cycle which allows you to wash a couple of items (up to 2kg) within 14 minutes. This washes at 30 degrees and only spins at 600 rpm. In reality, it takes around 20 minutes for this cycle to complete for me which is perfect for washing 1/2 items when you're in a real hurry. I use this cycle every couple of days to wash the kids' packed lunch bags and it's perfect for this. This machine is the easiest piece of tech I have used in a long time. It's pretty fool-proof. The large LCD display is easy to read and follow. 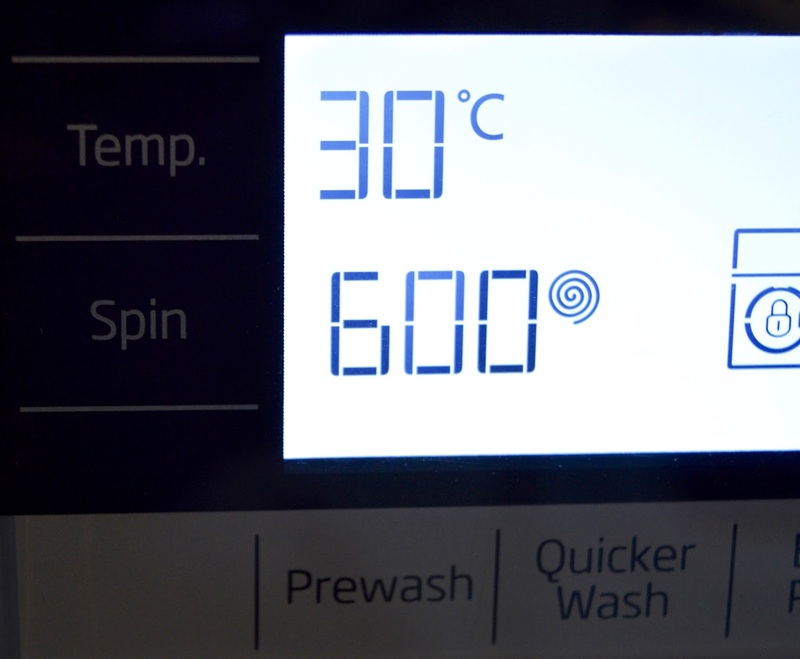 To start a wash, simply add your usual detergent, touch 'on' then spin the dial to the programme you'd like to use. There are 12 programmes to choose from including the quick daily wash, cotton, eco-cotton, night mode, synthetics, steam therapy and more. Then hit 'start' and wait for the wash to end. There is a clock on the LCD display which keeps you informed with how long is left, if the door is locked and at what stage the cycle is at. I like that this machine has been designed to fit into your life. A lot of the programmes can be customised to fit in with your lifestyle or needs. Some of the programmes can be reduced in time, temperature or spin speed at the touch of a button, there's a snazzy night mode which is quieter and uses less energy.You can also set a wash end time - I work from home so I probably won't use this too much but I imagine it's a fantastic function for those who work away from home and want to set a wash to finish just before they get home from work. There's nothing worse than a load of wet washing having to stay in a machine all day before you can empty it. There's also a waterproof care programme which has been designed to keep your waterproofs in tact for longer. As a family who loves the great outdoors and owner of multiple waterproofs, I love this function and can see me using it a lot when I wash our coats. Moving up from a 7kg drum to a 12kg drum has been significant for us! It's fantastic being able to get a lot more washing done in one go and I love that I can wash the kids' winter coats together and even our duvets now too. The door is nice and big too so the machine is super easy to load - no more trying to cram everything in and hope for the best. I love, love, love this function. Steam Therapy can reduce iron time by 50%. It's designed to reduce creases and eliminate odours - basically give something a quick refresh. This function is perfect if you've realised your kids don't have a clean school shirt over breakfast or if you want to wear a dress that has been hanging in your wardrobe for a while and needs a quick refresh rather than a full wash. I am somebody who hates ironing and I know I'm going to use this programme a lot. 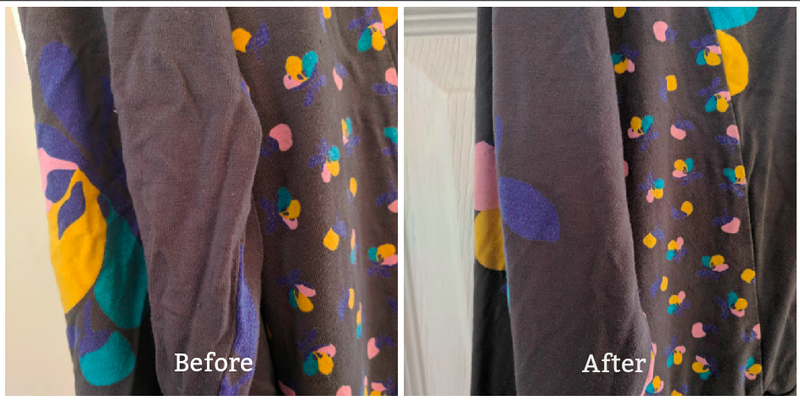 You put your clothes in dry and 15 minutes later (I timed it - it does actually take 15 minutes), your clothes will come out refreshed and with a lot less creases. I don't feel like this picture really does the technology the best justice but my dress went from looking like a crumpled mess and unwearable to looking like it had just been pulled out of a tumble dryer with minimal creasing. For us, the cycles take longer than specified. We often select a 2 hour 20-minute cycle and in reality, it takes over 3 hours and our 28-minute cycle actually takes around an hour. I know this won't be the case for everyone as it depends on a lot of factors but it's worth pointing out that your water pressure/temperature ect.... can increase the time taken to wash. It is disappointing that our washing won't be completed in 28 minutes as described. The machine also uses an energy efficient motor (it's rated A+++) and claims to provide a quieter wash - I have found the spin cycle to be just as loud as my previous machine and it's definitely not what I'd call quiet. It doesn't last for too long but it's not something you'd want in the background if you're entertaining guests for example. But despite this, I love my new Beko Washing Machine and it's the best washing machine I've owned by far. Being able to wash a full 12 kg of washing within 1 hour saves us SO much time. I love the Steam Therapy programme and can see me using this a lot to refresh dresses that have been hanging in my wardrobe before a night out when time is of the essence and I don't have time to search for my iron and ironing board. The Beko machine is super easy to use and uses less energy than my previous machine plus it looks a lot more stylish with it's LCD display. I'd also like to point out that although I haven't tested this in any way, shape or form, my clothes do appear to come out very clean - the whites in particular look a lot brighter. This could be my imagination of course but to me, my clothes definitely seem brighter and fresher now. 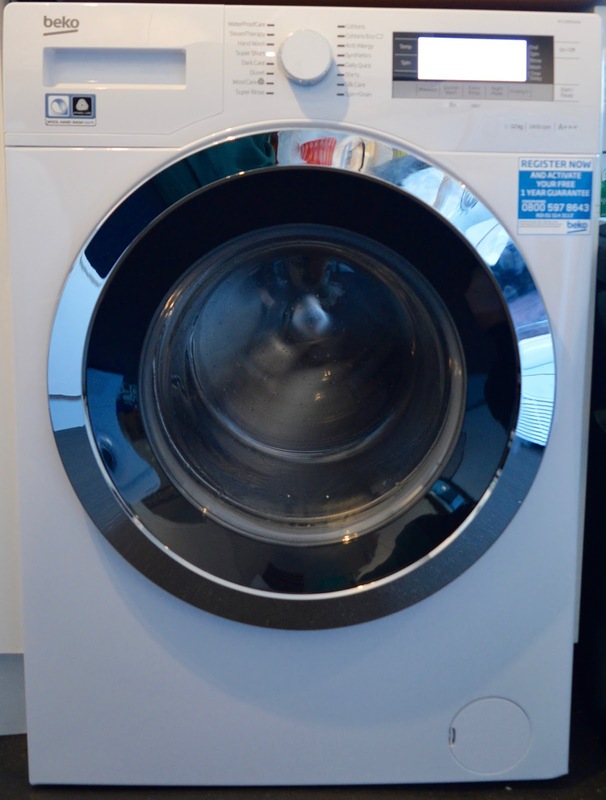 Despite my niggles, I would whole-heartedly recommend this machine to families of 5 who need to keep on top of their washing and are looking for little every day short cuts. Enter our giveaway below and if you win, you can select any Beko Washing Machine with a 28-minute wash cycle from this range here (subject to stock). Your prize will even include installation and removal of your old appliance if required. UK mainland only. To enter, simply use the rafflecopter below. You can enter using one option, or multiple options to increase your chances. Daily entry is available via Twitter. Prize includes delivery to UK mainland, standard installation and removal of old appliance if required. One winner will be selected from random from all valid entries within 14 days of the giveaway ending and notified via email. Giveaway is not open to Beko or North East Family Fun employees. No refunds or cash alternatives are available. North East Family Fun's decision is final. The six colour options - so many companies only provide the usual white, black or silver! The feature that appeals to me most is the Daily Quick programme that can wash a full load of laundry in just 28 minutes. I love that it can wash a load up to 12KG that is fantastic and very handy for bedding and big loads! Has to be the Daily Quick programme, a full load washed in 28 minutes! Daily quick programme - sometimes you just need something in a hurry! amazing that their machine can wash a 10kg load in 28 minutes!!! It has to be the Daily Quick programme for me! I hate waiting for the machine to do its cycle! The 28 minute wash cycle! Very handy! 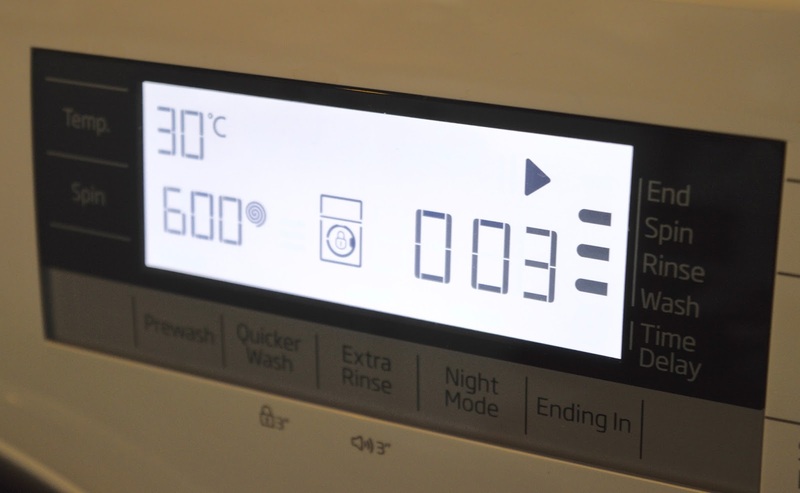 I find this particularly helpful the Daily Quick programme, that can wash a full load of laundry, up to a capacity of 12kg, in just 28 minutes. 28 minute would be my favourite and desired feature, especially with being a very busy household. Daily Quick programme sounds fantastic! the Hotpoint Machine which i have at the moment takes 1.45 minutes!! The 12kg capacity is very useful and love the steam therapy option. It would be great to be able to wash our duvets rather than a trip to the launderette. Has to be the Steam Therapy, With 5 nephews to wash for when they sleep over, this would dramatically cut down on ironing time. The daily quick is a life saver, absolutely trumps my machine in terms of time! Well doing 2-3 washes per day with only a 9kg machine. Having 2 kids a dog and me this would be perfect for our family. 12kg in 28 minutes. I’d be super dad with the amount I could get done in day. the 28 minute wash cycle - so handy! The 28min quick wash sounds amazing! My washing machine is broken and keeps flooding our kitchen so fingers crossed! I like the daily quick program. The six colour options - my home is very colourful so I love this. I have turned the dial to quickwash but the display is showing 2.20! I can't work out why it is not showing 28 minutes. Came here through google, as I own the machine, and wasn't sure what the steam therapy is for. I always use the 40c/1400 cycle, it's meant to take 1hr58mins, but it's ALWAYS closer to 3hrs, which is very frustrating!